There are only two things you shouldn’t talk about in a bar: religion and politics. Tread lightly, understand their perspective, next round is on me! The bar or public house has always been a place for folks to relax after the daily grind, grab a cold one and discuss the issues of the day. Bars are a place for social gathering where a natural ability for gab shines in this casual, open forum. Alcohol allows more free flowing conversation that people wouldn’t normally have without the helpful buzz of a beer. That not-so-helpful buzz can sometimes lead to controversial topics among impassioned dissenters. The purpose is to understand political conservation in bars, every bartender spoken to on this issue immediately cringed at the thought. Politics in bars. Then they would repeat the old saying, like Justin Rosehart, a Bartender from Mingles’. But do people really know how it is? Civil discussion on politics can be achieved, but how often is it. Trying to understand this rule myself, this set out the goal to understand how much of a problem this is or if it even is a problem. Bartenders in Laramie have an unwritten ‘no controversy rule’ to ensure there aren’t any fights or upsets, but they also have to balance keeping conversation with alcohol enthusiasts. “I try to keep myself neutral if someone brings up a hot topic and just try to understand their point of view without really sharing my own opinion” replied Rosehart as he eased up. Frolic is defined as being light-hearted and cheerful, a pleasant experience where potential conflict is just unnecessary. Looking around the bar itself, it is brightly lit and people are sharing and relating thoughts about their day having a good time playing games, this is frolic. “People do still talk about politics, we have conservatives, liberals, libertarians, but they all try talk among themselves. If they have something in common, then they will probably have conversation about that” said Rosehart. To see if this was a common theme of bars, Bud’s Bar would be the next necessary stop. 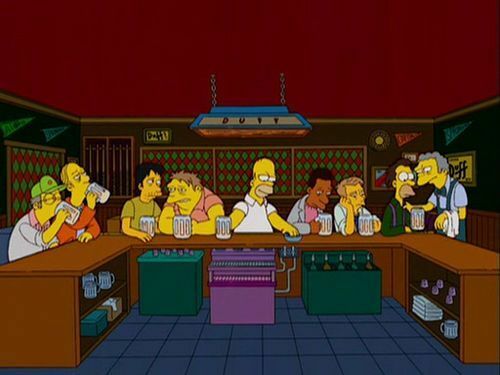 This is small bar with a nearly identical design to Moe’s Bar from The Simpsons. They have a host of weekly events including karaoke and trivia. The owner, Travis Benson, stopped and talked for a few minutes about his take on politics in a bar. One of the unnamed bar patrons, overhearing the conversation, commented on ‘getting in to it’ with a person sitting at bar. Travis shrugged it off and laughed at the obnoxiousness of the regulars. Bud’s Bar is place where these controversial topics aren’t much of a problem. This might be because of high proportion of regular customers and the comfortable atmosphere. In this how do the fairly drunk people feel about the exciting world of politics? This Saturday Laramie had a street dance downtown after a University of Wyoming football win. The street dance consisted of a lot of college students trying their hardest to drink and have fun. The music was loud and the smells of the food vendors were nice, but most importantly people were excited to meet new people. Several people were interviewed throughout the evening, but George West, a young, buzzed person in his twenties had the most to say. George seemed frustrated with the divisiveness and sensitivity to the untouchability of politics. His friend nearby nodded in agreement too. The conclusion is that people still want to have these political conversations, but they think at a bar or with strangers it really isn’t worth the stress it can cause. This writer is in the minority and this is what is important.